On Friday I took the next step in my Disney career. I applied for three Professional Internships at the Walt Disney Resort! Now don't get me wrong, I love to teach. But ever since I did the Disney College Program in 2008 and then again in 2009 I have wanted to work there again. Not only that but it is highly unlikely that I will find a teaching job right after I graduate. So doing a Professional Internship is the perfect in between job. Plus, I am still totally obsessed with living in Florida. Hopefully I will get one of the those and then what I plan to do is apply for the YES Program in October! Either way this will get me down to Florida where I will be living with Suzanne, Sara, and perhaps Kelly. I also plan on getting certified to teach in Florida so that way if Disney doesn't work out I have two different states to look for a job in. Next I have to call and set up a phone interview and then we will see what happens from there! I am so excited though, I know I have done everything possible to ensure that I get an internship. 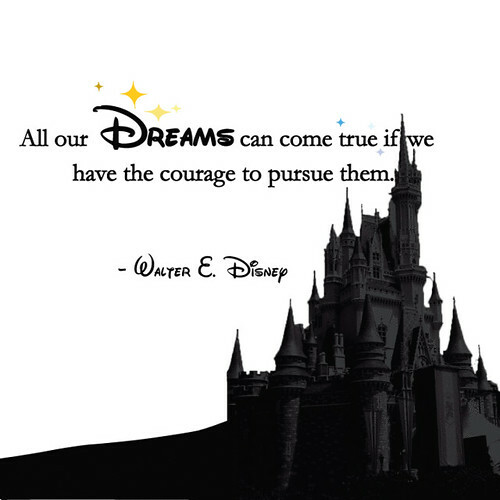 Here are a few quotes from Walt Disney, he is the creator of this amazing company and is a true inspiration!